For all of their power and capabilities, data centers are still susceptible to the disastrous effects of water, fire, lightning, earthquakes and extreme winter cold. It seems that winter has received an upgrade, which means that it’s more important than ever to make sure that data is being well-protected while it’s being housed in a data center. Should a data center succumb to an arctic chill, it can cause problems with cooling and fuel while making it more difficult for equipment to work at peak efficiency. There’s also the fact that data center employees might have difficulty getting to work on time if they’re able to make it there at all, which can create an all new set of problems and setbacks. It’s beneficial to have contingency plans in place that can mitigate any damage and make sure that operations proceed as normally as possible should something go wrong with the data center. It’s always better to be acting in these situations as opposed to reacting. 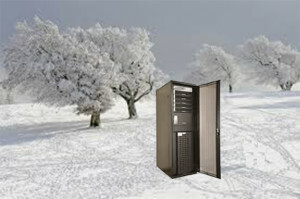 In order to properly prepare a data center for the cold, you need to understand how the cold can affect a data center. The cold can add undue stress on the data system, and that’s especially true if the frigid air outside is being used to keep the center warm. The center’s drain lines can freeze over in addition to heating coils, fuel systems, humidification units and cooling towers. You never realize how much effort goes into keeping data centers at the proper temperature and setting until a cold snap blows through town. Frozen air conditioning units might spring leaks, and snow might find its ways into the intake vents, which can make it all but impossible for air to properly circulate and lead to a system wide shut down. One of the best ways to prevent these mishaps from occurring or at least keep them from completely crippling a data center is to be diligent when it comes to maintenance and upkeep. Make sure all battery warmers, block heaters and engine oil heaters are in working condition. Prevention and contingency plans will also depend on where the data center is located. If the data center is located in an area that receives especially bitter winters, it might be necessary to set aside the funds necessary to make sure that the center is always being well-heated. It’s a good idea to start saving this money up as soon as possible beforehand so that finances don’t take a bigger blow than necessary. You know that winter is coming, so you might as well prepare for it in the spring. Generators should be insulated and heated, and you’ll want to keep humidity in mind whenever you’re dealing with electricity and cold. It’s not unusual for anti-static wrist straps to be used in order to make sure that equipment is properly protected during the winter. The use of ultrasonic humidification can result in much better energy savings when compared to the use of conventional humidification methods. The weather forecast should also be monitored so that there’s ample time to call in extra employees and help if necessary and so that there’s enough time to gather any necessary extra supplies. Employees should be just as well-protected from the extreme winter cold as the data center itself. Even if a data center is being built in an area that isn’t known for its punishing winters, there should still be plenty of room in storage for salt in case things take a turn for the worst. It’s also a good idea for there to be stairs instead of ladders for employees to use to move between levels since ladders can be a huge hazard if they ever ice over. The areas employees frequent for extended periods of time should be kept warm so that employees remain comfortable enough to be able to focus on their jobs. Snow drifts are something else that should be taken into account whenever a data center is being built since they can damage the structure of the center and lead to numerous other complications. Aside from keeping employees comfortable, there’s also the fact that employees might not be able to make it in to work due to road closings. Individuals who are at the data center when inclement weather hits need to well-supplied so that they can continue working as normal and so that productivity doesn’t dip. There should also be proper employee protection, such as gloves and heavy coats, for when maintenance needs to be done on outside equipment. Even with the right winter protection, there’s still a chance that maintenance might take longer than it usually does since employees might need more breaks and have to deal with equipment that could be iced over. The worst case scenario always needs to be taken into account when it comes to preparing data centers for a cold snap. Be proactive and make sure that employees are fully aware of what they should do if the weather takes a frigid turn.